Our family’s cabin (pictured above) is located near Sturgeon Lake, MN off Interstate 35. It’s a log cabin built in 1994 from Montana grown, beetle killed, lodgepole pine. Consisting of main floor, a loft, and a unfinished basement, and nestled in the northern woods of Minnesota, it’s a pleasant break from the city. Our cabin is pretty easy to get to. Continue on Walters Road, it’s a very winding road, watch for oncoming cars, but DO NOT TOUCH THE SIDE or you will go in the ditch. The first mile or so is paved, the rest of the way is on dirt roads. Make sure you slow down before crossing from pavement to dirt. From Walters Road, take a left at the “T” on to Military Road (Note the farm house across the street). Continue on Military, you will cross a small bridge (notice the concrete side barriers and pavement under your wheels — this is my river (The Willow River) and almost everything to your left after the bridge is our property). Take a left at the very first intersection (a “T“) after the bridge/river on to Jackpine Ln. We are the first easy-to-miss driveway on the left. It’s a log cabin with a metal gate, and you can see the cabin from the road, but not as you drive up. Park on the left hand side of the road (closest to the cabin), or in the driveway if there is space. Below is a map how to get there. The route in red is the backup route, if you click on the route, you will get the directions for that route. View the Cabin Map as a larger map. The cabin was built in August of 1994 from beetle killed, lodge-pole pine from Hamilton, Montana. Bob Kliegel was the log builder. He had built several other log structures before this one. The logs were first fitted together on the builder’s property in Pine City, MN in two parts. After all the logs were fitted and numbered, the building was disassembled and placed on a truck for transport to our property. Like a large Lincoln logs set, after it arrived at the site, it was reassembled in under two days with the use of a crane. The logs are fitted together by a method called Swedish Cope or Scribe-fit. This method involves using a scribe to trace the contours of the lower log onto the upper log. After the contours are traced, the line may be cut out with a chainsaw to allow the two logs to fit perfectly onto one another. This eliminates any gaps and does not require any chinking as you see in some cabins. Prior to the log’s arrival, the basement and main cabin subfloor were in place. The logs were placed directly on top of the cement block basement and plywood subfloor. Electrical wires were pulled through holes drilled vertically between each log when the cabin was disassembled. This allowed electric boxes to installed directly in the logs on both of the upper floors. By winter of 1994, the cabin was closed in with windows and doors, and the deck was built. Two days after the roof was finished the first snow arrived. Since the only heat it had was in the basement, we slept there as we continued to finish the upstairs. We also did not have water or any plumbing the first winter. Work continued for several years, adding the loft, flooring, kitchen, and bathrooms. As the building dried and settled, it shrank. The windows, doors, and any internal walls were designed to allow for this shrinking or they would be crushed by the weight of the logs. Each of the windows and both of the doors have a space above them to allow for this shrinking. This space is covered by the molding. The molding is designed with a front part attached to the logs above, and the inter part attached to the lower window. This allows the logs to move, but not open any cracks between the building and the windows/doors. They are held in on the sides by two by fours that slid in grooves in the logs and are only screwed in on the bottoms. 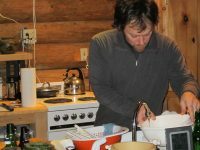 The cabin is heated by a wood stove on the main floor and in-floor heating in the basement. The basement rarely gets below the mid 60’s but the main floor regularly freezes in the winter during the week when no one is heating it. For this reason, all water and most power is turned off while we are away. The cabin is fully stocked with what you need for a nice weekend away. With a full kitchen, 1 & 1/2 baths (full bath is in the basement), it’s heated by a wood stove and it sleeps 8. The building is only 24 by 24 feet, with a 24 by 14 foot loft. The loft has 2 sleeping area’s separated by a wall but open to the front of the loft. 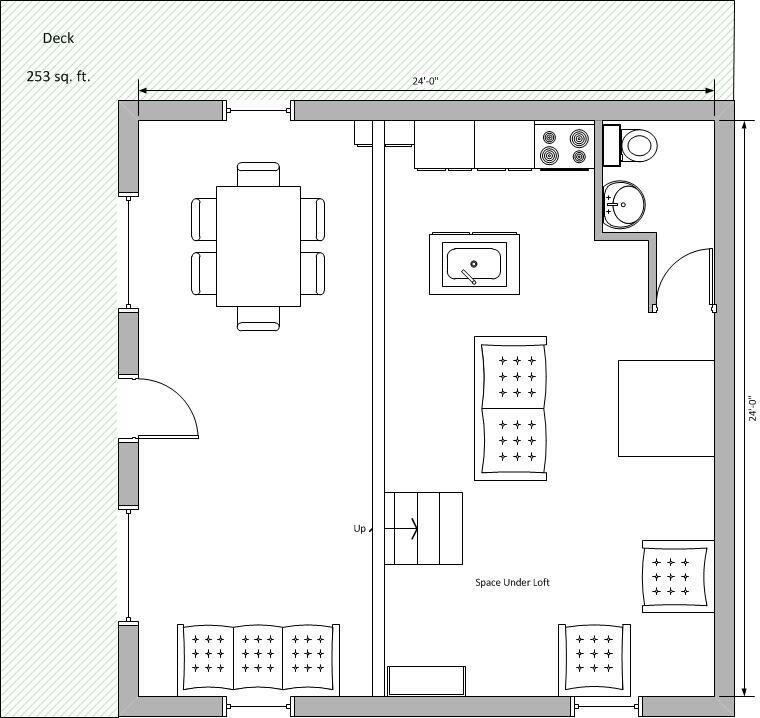 The far space has a double bed with a small sitting area next to the outside door (to a small balcony that may someday be built). The near side has two single beds. Besides the bathroom on the main floor, there are no “private rooms” on the main level and loft. Below this space is the basement. The only way of accessing the basement is by going out side and around to the basement door (under the front porch). The basement has a bedroom, the 2nd bathroom, and a shop. The power and water are both managed in the space between the bathroom and the shop. Although the cabin is beautiful, some times you need to get out. While the cabin is not in use, the power and water are turned off. To turn on the power, you must go into the basement, with any luck the overhead light will still be powered. Go to the center back wall between the bathroom and the shop. There you will find the power panel, open it. In the winter, turn on ALL the circuit breakers, in the summer time, there is no reason to turn on the two large double circuit breakers near the bottom left of the panel (as they are for the in floor heat). To turn the water on, to your right while looking at the power panel, you will find a light switch, turn it on (this will turn on the pump). Next near you feet you will see a pipe coming out of the floor with a large handle on it, turn the handle so it is parallel with the pipe (pointing in the same direction). After you do this, you should start to hear the water flowing threw the pipes and most likely splatters out of the tabs as the air bleeds from the system. Last walk around and turn off all the different faucets, don’t forget the shower (I left that one going for a night once).